American Style, Pink Wall – Melrose Avenue LA) but we have already June! It looks like the summer season has finally reached us in Germany! I’m so happy when I wake up in the morning and the sun begins to shine. Today, I showed you a new simple outfit, but with a touch of glamour. I think these shoes I’m wearing in the photos, are the best shoes I’ve ever had… the most comfortable! The new high waisted pants are by H&M. I combined the pants with a blue jacquard top by Mango. As accessories I selected a clutch and a bracelet by Mango. What do you like the most about the summer? 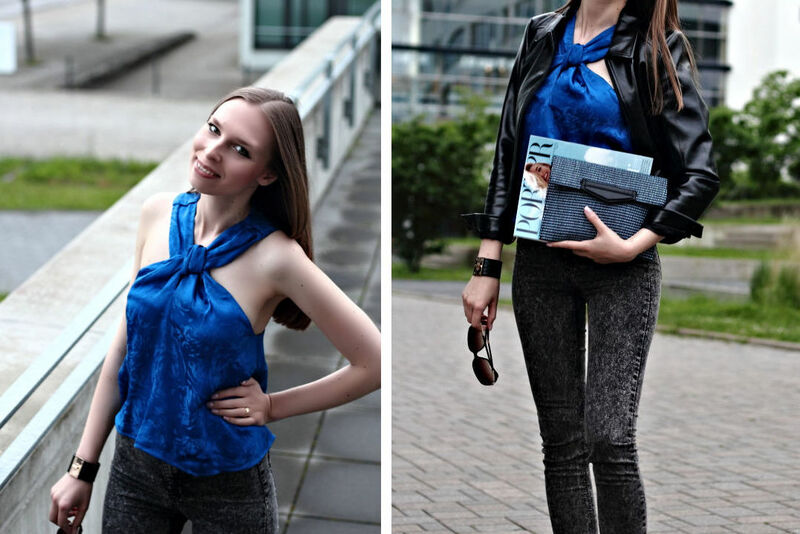 I love this top – it’s so gorgeous! It looks really great with the dark pants too. What a chic look! Love those pants, but that top really steals the show! Love that color!! Such a gorgeous top, the color and silhouette are so pretty! I love how you styled it! I`m liking this outfit. The blue top made the whole outfit “pop”.